Let’s dig into some of the biggest business school news emerging out of Los Angeles this weekend. 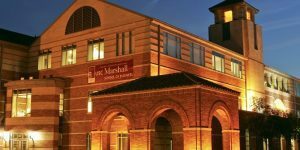 UC Irvine’s Merage School of Business has climbed in the Financial Times rankings, to 24th among nationwide schools and to 8th among public school of business in the U.S.
Merage’s faculty diversity is also helping the school earn some well-deserved praise. More than half of the business school’s faculty are women, making it the first in the world for this distinction. Additionally, the school has the 7th highest salary increase for alumni compared to pre-MBA earnings. As for research capabilities, Merage placed 37th in the world and 29th in the United States. See the Newswire press release for more on the UC Irvine ranking. You can also read more about the recently released ranking FT here. A USC Marshall School of Business alum is tackling an enormous task—shifting car-centric Los Angelenos to using public transportation. Metrolink may be an integral part of the 2028 Olympic Games in Los Angeles. Wiggins is not only the first African American to be named to this position in the agency, but also the first woman. She will be facing with the additional challenge of revamping an outdated and underutilized system, which will be more important than ever during the 2028 Olympic Games. Having held high level positions at several of the agencies that comprise Metrolink, Wiggins is perfectly suited to lead the way as the system evolves. Born in Oakland, CA, Wiggins attended Whittier College for business administration. After taking a temp job with the transportation commission in Inland Empire, CA, her career began to flourish during the pursuit of her MBA. For more on Stephanie Wiggins and her role with Metrolink, read here. David M. Smith, Ph.D., a leading economist at Pepperdine Graziadio, was quoted recently in the LA Times on the recently released employment statistics for California. While the rate of unemployment is declining, it does not necessarily mean the job market is truly stable. While “jobs are available for those who are in need of employment … Increasingly employers, especially small and medium-sized businesses, are struggling to find workers. Employers are grumbling about not having enough help and new hires simply not showing up,” Smith says. Click here to read more from the LA Times article.